Yes, it was a fish! And proud of it! 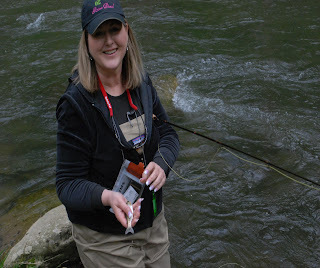 Patience in fly fishing? No... Not at all. Ok...We all know there has to be a certain degree of patience involved here. After my last three years in the sport, I still have a few strands of hair left! Haha. Honestly, I needed something to help me learn to be more patient in everything. And this my friends, has given me a whole different way of looking at things. And I also look at the river a whole different way. When I first started, I would pounce right in any old water and start casting to who knows what! Maybe even River Sprites!! (Don't ask) And sometimes, I would get lucky and catch something. But, after many days out and listening to more "knowlegable" fly fisherman out there...I am slowly learning patience. Sometimes, I end up fishing a given spot for too long before I realize that my plethora of casts have spooked any fish still in there, and I would be better off to keep moving up/downstream and come back to the spot after its rested. Does this sound familiar? That is one of the wonderful aspects of this game we play, You against the fish and who will outlast the other. I have been known to work a feeding fish for a long time, whether it be nymphing or on top, if that fish is a good one and keeps eating, I'm staying with it. Patience. Now, if I'm only working a run or hole that looks "fishy", with no visible fish, then my patience can sometimes fall short. I would much rather fish to a fish, than fish an area that just looks like it has fish. If I know the hole I am fishing holds trout, I will throw for a while. If it just needs a "hatch" to get it rolling, and I feel confident that it isn't too far off...I will take a rest. Maybe grab my Snickers and Diet Coke and watch for awhile. I guess that I don't catch a lot of fish that way, but somedays are just made for relaxing. But when I do catch one that I have been after for an hour, I feel like I won the battle! 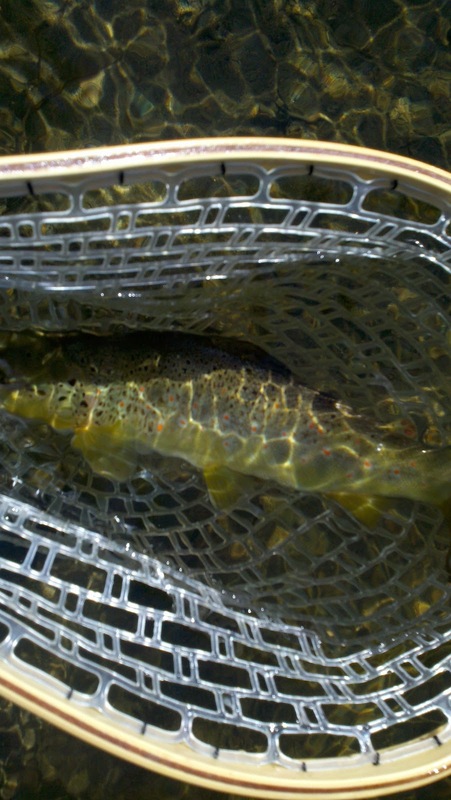 How many of us fly fishermen, need to improve on this little thing called "impatience"? Do we sometimes go tromping through something that maybe we should have checked out with a few casts first? Here's a story from a friend and guide, Kerry Almond. He experienced this first hand at a recent trip to Montana. 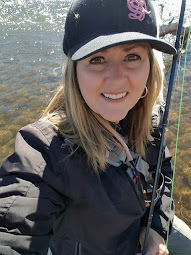 "Patience starts from the second you get out of your car and walk down to the river.....Today for example, I was fishing with newbs (new to flyfishing) and came on a beautiful run. The newbs immediately jumped into the river and waded across to cast to the far bank where there was some beautiful eddies and pools off of the main channel of the river. I knew that they had just made a huge mistake, but I wanted to teach them an important lesson. After they had caught a few fish and waded back to the bank, I told them to watch what I was about to do. 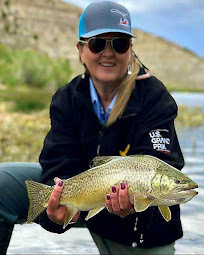 I stood up and walked up the bank that we were sitting on and threw my flies not four feet off the bank and caught the biggest fish of the day. They were awestruck. I explained to them that if they would have slowed down and took a few minutes to look at the river, they would have noticed that the bank closest to us had a huge undercut bank. They were only focused on the gorgeous pools on the other side. 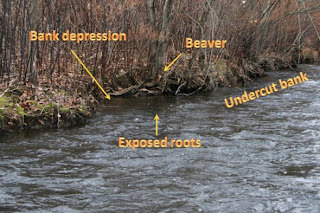 They should have looked close at all of the possible places that fish can hide and work them all closest to furthest and work the whole river. 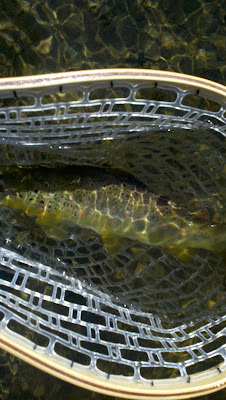 They would have either spooked the fish by wading across or just missed the undercut bank all together...So, if you are patient, you wont miss the feeding fish nose, the undercut banks or the hatching bugs and you gain more knowledge by just sitting and watching for a few minutes before you get out there and start fishing..."
SUNDAY TIPPET: Patience or the lack thereof? I guess that we have to decide how much we want to put into it and what we want to take out of it. But, for me...I'm going to try dissecting the river a whole lot more. Starting close and working out. And on occasion...sitting on a rock with my fly box and watching what is going on in front of me and around me. It's all good. I actually learned this the other day....as I was crossing a river in Maryland, I stepped 2 feet from a big old native brown. The only reason I knew it was there is because I scared it so much that is jumped a foot out of the water before taking off. Had I not been in such a hurry to look for a "nicer" section, I would have spotted this fish and had a chance at catching him. I think patience in fishing is key for success for any species of fish. I too find myself thinking should I hit that run, or hole because it looks more appealing than the one I am fishing-----but again that little voice keeps saying should I stay or should I go????? I am still in the learning stages here with the trout fishing and yes my number one obstacle to fight through is PATIENCE. Great Post!! Hi Emily. Back in the mid 70's BF (before fly fishing) I had a neighbor that was my fishing buddy at the time. We went up on Silver Fork of the American River. He sat in one spot and I walked the river fishing every nook and cranny. An hour later I came back to where he was, with a limit, and he hadn't caught a fish. On the way out I stopped and fished a little pool half way up the hill and caught one from there. That day he became a believer. I still fish the same way today. Bill ~ I took a class this past weekend, that showed me that my lack of patience causes me to omit some of the stripping at the end of a drift that could possibly bring in a fish at the end. Taking advantage of all the possibilites on the water is so important! Mark ~ Well, you have a point well made there. The more water you cover should work in your favor most of the time. Thanks for sharing! Very good points. 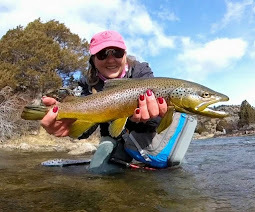 I find that I do better when I at least move a little, but sometimes a particular run is so much fun to fish that I have a hard time pulling myself away. Maybe I should bring along a spinning rod and Powerbait for those times. Howard ~ I am betting that you will catch twice as many with the Powerbait!! Ha! But, where is the fun in that??? good little post. its amazing the fish you can pull from water that gets neglected by fly fishers. i have pulled some of the nicest trout i have ever caught out of some water that didnt looks "fishy" at all. 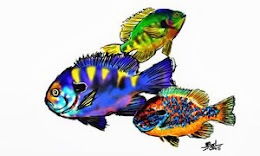 speaking of water that looks "fishy" check out my blog! my day on saturday ended in a fishy hole with a crazy sight. I also tend to be a bit more patient, working a single spot in every manner imaginable. But over the last few years I’ve also learned to apply that patience before even stepping near the water. Like Brookfield Angler’s experience, a few rivers I fish will hold fish only a few feet from the bank I need to cross to get to the water, so I often stop and watch the water from a distance. This calls for an “over-land” cast 10 to 12 feet away from the edge of the water, which invariably causes the raising for some eyebrows. As for sticking to one spot, I try to have a bit of fun with it, whether trying some self-tied fly patterns that have my own “twist” on a standard or trying some wet flies, something I’ve not done much in the past, but is invariably good for a fish or two at tailout. It’s certainly hard to shake that feeling that the fish are where they’re supposed to be, and sometimes harder to leave that spot. Cinching The Knot For Success! A Compleat "One Bug Is Fake"